The key to liver healing is to understand not just the physical biology of the liver, but also the spiritual and emotional aspects that go alongside these. In his book, advanced G-Jo, Michael Brate describes the liver as the overseer- almost machiavellian; it is like a silent power behind the throne. It almost never complains with pain, abut it does show many other symptoms. I think overseer is a good description for the liver. Perhaps if we think about how many parts it plays we would get a better picture of it. It produces thyroxin for the thyroid. It produces plasma for the circulation system. It produces bile for the pancreas, its cells store a great many substances for our health. It is the foreman of the factory in other words, keeping an eye on the other workers and having just the right tool for the job at the right moment. So let's look at how that connects with liver healing on a more spiritual level. When you think about the the liver being the overseer, looking after the workers, you can see that it would be connected to jobs which have to do with administration. Imbalance can have to do do with having to much to do or having to do some kind of administrative work which is not in the person's best interest. It couldn't be more closely connected with today's stress problems, really could it? The emotions are often to do with anger and aggressive drive. It is also to do with rational activity and protecting oneself justly. The kind of crying like a safety valve is associated with this kind of imbalance, and is often one of the more obvious clues that there is a need for liver healing. The easiest way to understand this aspect of the liver healing is to go to the ancient myths. In astrology the liver is ruled by Jupiter. 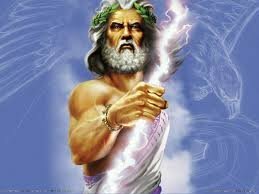 Jupiter was the roman god that dispensed justice and authority and was the king of the gods. He is also associated with good living and wealth , male sexuality and potency, worldly success, alcohol, travel and wisdom and the highest kind of spirituality. He is known as the father figure. In Greek mythology he was Zeus, in Egyption he is Osiris, in Morse Odin and in Britain sone aspects of Arthur are archetypal. So we are building up a complex picture of the liver. It is difficult to be spiritually balanced with a dysfunctioning liver and so you may find that these people are too grounded or material, or conversely what I would call "off the wall" about spiritual matters especially New Age Philosophy. Imagine a pendulum swinging...if balance is off, either one way or another as a therapist I can usually tell that liver healing is where I will need to start on the patients therapy. Detox the liver and you can usually see some equilibrium starting to come about. Another significant aspect to the liver is how the body deals with trauma as it settles very early from childhood into the liver mainly because the child is surrounded by authority figures. Any kind of shock, anger that could not be vented because of the childs social position, especially if perpetrated by a male figure, (and this includes sexual abuse) or hardship through poverty is likely to be stored in the liver. Ok so how aromatherapy goes about liver healing then. Liver healing or as we call the - Hepatic Oils are: Eucalyptus, Rosemary, Peppermint, Grapefruit, Carrot Seed, Bay, Lemon and Sage. Angelica, Chamomile, Cypress, Immortelle, Rose, Santolina, Verbena and Violet. Focus on aligning chakras that correspond to the organ - in this case the solar plexus chakra.